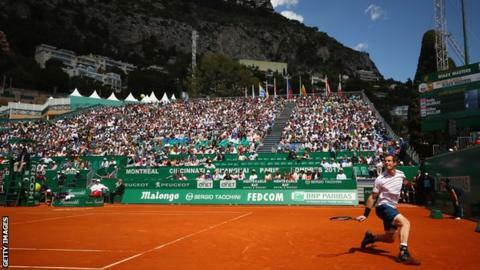 Andy Murray made a winning return to the ATP Tour after a month out with an elbow injury at the Monte Carlo Masters but Kyle Edmund lost to Rafael Nadal. Murray, 29, was broken in the first game by Gilles Muller but soon asserted his class en route to a 7-5 7-5 win. The world number one last played on the ATP Tour in Indian Wells on 12 March, though he contested an exhibition match against Roger Federer on 10 April. Edmund lost 6-0 5-7 6-3 to Nadal in a thriller lasting more than two hours. The British number three lost his serve in the opening game of the match before nine-time champion Nadal cruised to the first set. But Edmund won his first game at the start of the second set and hit a number of forehand winners en route to levelling the match. He continued to impress in the decider as the pair exchanged early breaks before the Spaniard took a decisive 4-3 lead and won the next two games to complete victory in two hours 19 minutes. Murray, the top seed in Monte Carlo, gave up three double faults in the first game of his match, then hit long to gift Luxembourg's Muller the break. The Scot continued to labour on his serve but somehow limited the damage, saving break point in the next game then fending off two set points while serving at 4-5. Muller's failure to capitalise on Murray's rustiness was then brutally exposed by the Scot, who broke the world number 28 in back-to-back games to claim the opening set, before recovering from an early break in the second to wrap up victory in one hour 55 minutes. "It was a tough first match," Murray told Sky Sports. "I started slow and wasn't serving well at the start. "I only started serving properly four, five days ago, so I knew it was going to take time but I didn't expect to start the match serving like like that." Murray, handed a first-round bye, meets Albert Ramos-Vinolas next. Third seed Stan Wawrinka of Switzerland is also into round three after beating Czech Jiri Vesely 6-2 4-6 6-2. Fifth seed Marin Cilic and sixth-seeded Dominic Thiem also progressed.